(L-R) Dr Prakash Babu, Pro-VC University of Hyderabad, Dr Nina Federoff, Molecular Biologist from USA. Second Best Startup- Sridhar Iriventi, Founder of Go Bhaarati, Dr Reddanna, Executive President, FABA, Phani Pattamatta Executive Director, The Indus Entrepreneurs, Dr Sreedhara Voleti, CEO BioNest University of Hyderabad. Hyderabad: The Indus Entrepreneurs (TiE) Hyderabad announced the winners of TiE Hyderabad Agri-Biotech Startup pitch in a daylong event held on 20th November at the PJTS Agricultural University. TiE-Hyderabad invited 13 startups from 27 applicants, to pitch to investors and entrepreneurs. In the final round 6 startups took part including the winners- BODHA, GoBhaarati, and UrbanKisaan. Others included CropIQ incubated at SRIX Warangal, Vectrogen Biologicals incubated at BioNest in University of Hyderabad, SiriCrops from FIK e-commerce. 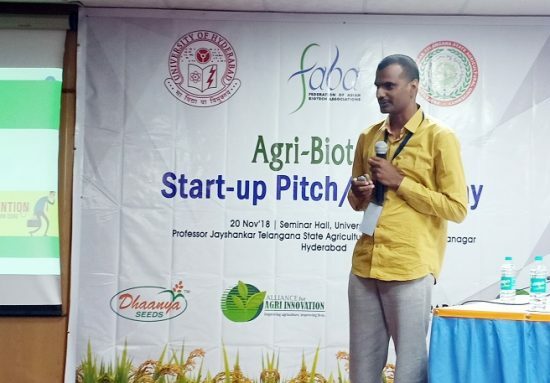 TiE Hyderabad Agri-Biotech Startup Demo Day jointly hosted by FABA (Federation of Asian Biotech Associations) had University of Hyderabad and other players from Agri-Biotech domain. This event brought together Agri-Biotech Technology Business Incubators & Accelerators from across the country to promote the ‘Spirit of Entrepreneurship & Innovation’ in the Agricultural sector. 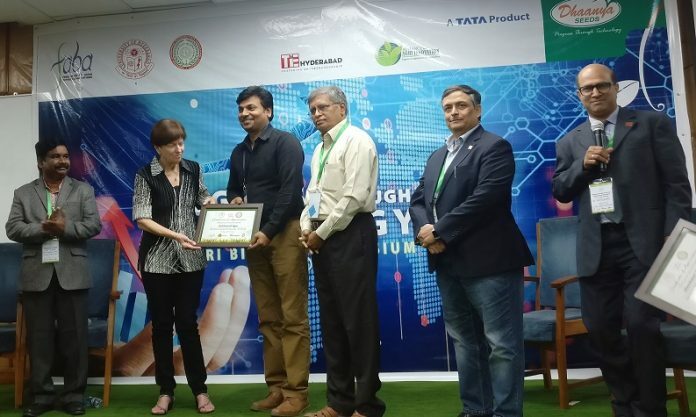 “We made a new beginning today, by creating a platform and helping Agri-Biotech startups to connect with leading investors, successful entrepreneurs and global Innovators, Researchers from Academia & Students to network, collaborate, learn and succeed.” Phani Pattamatta, Executive Director of TiE Hyderabad said. “First Best Award winning Startup Pitch of the Day”, Co-founder of BODHA Mr Akkineni Rama Prasad. Winner BODHA took away One Full Year TiE Associate Membership fee, completely waived-off. The business models presented also attracted potential partnership interest by incubators, customers, and investors present at the daylong event. The platform provided good opportunities for the participating startups to pursue these connects further to convert into meaningful opportunities for their startup growth. The eminent jury panel comprised of Venkatadri Bobba General Partner at Ventureast and TiE Hyderabad Charter Members, AVN Reddy, CMD of Roshini Crops, Dr Balaji Bhyravabhatla, MD of Hylasco Bio and Srinivasa Satti MD of Finvista Advisors. Winners were declared after evaluating parameters such as innovation driven ideas, scalable customer solving abilities, unique differentiators, business plan and team strength, target customers, growth potential including current revenue streams and future projections, through their pitch. At the parallel sessions held during the day, Global speakers from agri domain, touched in depth of innovations and advancements in the sector. The eminent panellists expressed their perspectives about the future potential & challenges ahead for the Agri sector. For participants, it turned as a day to gain insights into newer concepts, explore emerging opportunities, network with thinkers and innovators from successful agri-bio entrepreneurs and investors.